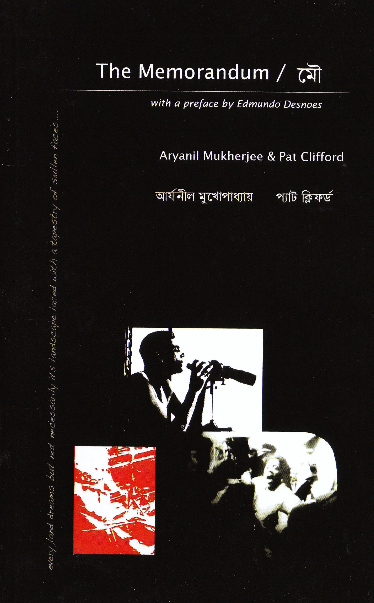 The Memorandum/MOU is the second film-inspired bilingual book of collaborative poetry by Pat Clifford and Aryanil Mukherjee. 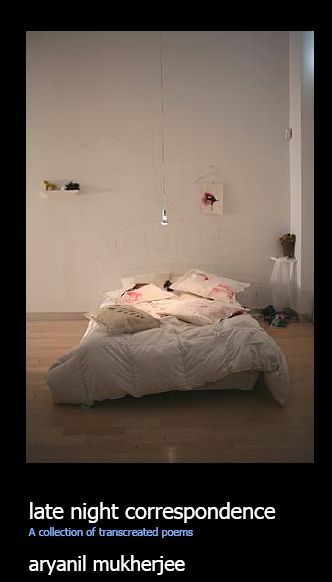 The book-length poem draws from Thomas Alea's revolutionary Cuban film "Memories of Underdevelopment" (1968) based on post-revolutionary Cuban society. Split into chapters named after music forms, the poem, in many ways and stages identifies certain themes from the film and transforms them to tangential planes of personal and contemporary reality. The textual collaboration is performed at all levels - line, stanza, page and chapter. In the preface, Edmundo Desnoes writes, "Both Memories of Underdevelopment and The Memorandum are aware that we are not only our colorful circumstance but also our individual consciousness, our inner discourse rooted in our land and its inhabitants." Aryanil Mukherjee's quietly insistent lowercase poems bring us such delights as "a breeze met long since," "the touch of language," and "speakability." His voice is fresh, always firmly both in and out of focus: "but somehow the train still / moves / dragging a chain of oblong sentences." late night correspondence sparkles.